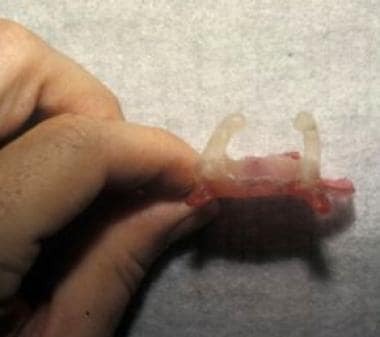 In presurgical orthopedic therapy, orthodontic techniques are used to mold the maxillary, alveolar, and nasal tissues of an infant with a unilateral or bilateral cleft lip and palate. Other terms used for these techniques are neonatal infant orthopedics, presurgical infant orthopedics, and nasal-alveolar molding. Because the infant does not yet have teeth, the term orthodontics would be inaccurate; thus, orthopedics is the preferred term. External force can be applied by external taping of the lip, a head cap with elastic straps across the prolabium, or a surgical lip adhesion. See the image below. 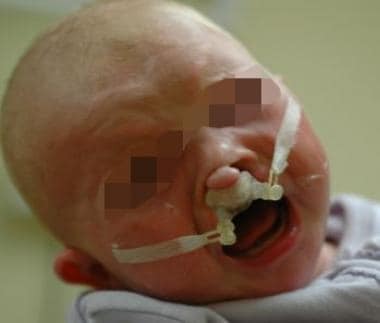 A child with unilateral cleft lip and palate being treated with tape adhesion. Presurgical orthopedic devices are a controversial topic in cleft treatment. Arguments against their use include the potential for long-term growth effects and potential feeding difficulty. [8, 9] With increasing clinical experience, the long-term outcome and the specific role of presurgical orthopedics are becoming better defined. [10, 11, 12, 13, 14] Empirically, molding can narrow the width of clefts and make subsequent surgery less technically demanding. The long-term outcomes of individuals treated with this protocol will determine its future acceptance. Contraindications include a lack of family and patient compliance or acceptance of the device. Several large case control studies have demonstrated adverse outcomes in protocols using active presurgical orthopedic therapy. Henkeland and Gundlach reported that the Latham-Millard active orthopedic device had an adverse effect on facial growth. Berkowitz reported worsened occlusal outcomes in the patients treated with the Latham-Millard device. Matic and Power found maxillary growth to be decreased after active presurgical orthopedic therapy in unilateral and bilateral clefts, respectively. [23, 24] They also found that almost all patients treated with gingivoperiosteoplasty or primary bone graft also required secondary bone grafting. Bongaarts et al reported on results from the multicenter Dutch cleft experience; they found that presurgical orthopedic therapy with a passive acrylic plate similar to the nasoalveolar molding system showed no improvement in occlusal outcomes. Uzel and Alparslan published a meta-analysis of 8 randomized controlled trials and 4 case-controlled trials with presurgical orthopedic therapy appliances; they found no long-term positive effects on the studied treatment outcomes in patients with cleft lip and palate. Van der Heijden et al in a meta-analysis of 12 studies of presurgical orthopedic treatment of unilateral cleft lip found inconsistent results on nasal symmetry. Both authors of the meta-analyses concluded that studies were heterogeneous and more randomized controlled trials are needed to evaluate the effects of different surgical protocols. The lips surround the entrance to the oral cavity. The upper lip extends from the base of the nose superiorly to the nasolabial folds laterally and to the free edge of the vermilion border inferiorly. The lower lip extends from the superior free vermilion edge superiorly, to the commissures laterally, and to the mandible inferiorly. Around the circumferential vermilion-skin border, a fine line of pale skin accentuates the color difference between the vermilion and normal skin. Along the upper vermilion-skin border, 2 paramedian elevations of the vermilion form the Cupid bow. Two raised vertical columns of tissue form a midline depression called the philtrum. The philtrum is located between the paramedian elevations of the vermilion and the columella above. The oropharynx is the middle part of the pharynx directly below the soft palate that communicates anteriorly with the oral cavity proper by the isthmus of the fauces, also known as the oropharyngeal isthmus. Specifically, the oropharyngeal isthmus is bound superiorly by the soft palate, laterally by the palatoglossal arches, and inferiorly by the posterior third of the tongue. The most prominent feature of the oropharynx is the two folds that are termed the pillars of the fauces, the palatoglossal arch and the palatopharyngeal arch. The palatoglossal arch contains the palatoglossus muscle and travels anteroinferiorly from the soft palate to the lateral aspect of the tongue. For more information about the relevant anatomy, see Lips and Perioral Region Anatomy and Pharynx Anatomy. Also see Nasal Anatomy, Mouth Anatomy, and Facial Bone Anatomy. Children with cleft deformities require a multidisciplinary approach to reconstruction. A team approach to treatment is the standard of care. Close cooperation of the surgeon with the orthodontist is necessary to achieve desirable outcomes with presurgical orthopedic therapy. The presurgical phase involves the application of the device, activation of forces, and treatment adjustments. In passive appliance protocols, deformational forces are transmitted through soft tissue. Tape adhesion may be used as an initial or as a complete treatment. Tape is applied to the infant's cheeks with some traction directed toward closing the cleft gap. A base layer of tape may be used on the cheeks in order to prevent traction blisters. 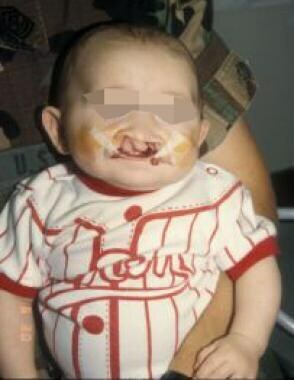 Tapes are replaced by parents daily or more often, keeping a constant deformational force closing the cleft gap. In active appliance protocols, such as that of Latham, the deformational forces are transmitted directly to bone via trans-mucosal pins. As such, the appliance must be secured in the operating room. Once placed, adjustments are made by turning a traction screw on the appliance. Surgical cleft lip repair reestablishes the soft tissue and muscular forces on the easily moldable maxillary arch segments. Two categories of appliances are used, passive and active. Passive appliances maintain the distance between the 2 maxillary segments while external force is applied to encourage posterior repositioning. This external force can be external taping, a head cap with elastic straps across the prolabium, or even a surgical lip adhesion. See the image below. A child with bilateral cleft lip and palate being treated with a nasoalveolar molding device. Active appliances are fixed intraorally and apply traction through mechanical means such as elastic chains, screws, and plates. For bilateral clefts, external pressure is often used to help maintain the premaxillary component within the arch alignment. Soft elastic tape across the premaxilla, a head cap with elastic traction, or lip adhesion have been used prior to a definitive lip repair once the arch segments have approximated. See the images below. A child with bilateral cleft lip and palate being treated with tape adhesion prior to beginning nasoalveolar molding therapy. The same child being treated with a nasoalveolar molding device after tape adhesion. The palatal appliance may be modified to include a nasal extension to help improve the nasal tip form. Surgeons must alter their surgical techniques to optimize the advantages offered by presurgical orthopedic therapy. Details are provided in Bilateral Cleft Lip Repair and Bilateral Cleft Nasal Repair. When presurgical orthopedic therapy is used to convert a wide cleft into a narrower one, less dissection and hence less surgical trauma will be necessary. More controversially, there is potential with the narrower cleft to perform primary bone graft or a gingivoperiosteoplasty. Alzain I, Batwa W, Cash A, Murshid ZA. Presurgical cleft lip and palate orthopedics: an overview. Clin Cosmet Investig Dent. 2017. 9:53-59. [Medline]. Mazaheri M, Brecht LE. Presurgical Orthopedics. Losee JE, Kirschner RE. Comprehensive Cleft Care. New York: McGraw Hill; 2008. Ch. 45, pp. 693-700. Sandy J, Williams A, Mildinhall S, et al. The Clinical Standards Advisory Group (CSAG) Cleft Lip and Palate Study. Br J Orthod. 1998 Feb. 25(1):21-30. [Medline]. Millard DR, Latham R, Huifen X, Spiro S, Morovic C. Cleft lip and palate treated by presurgical orthopedics, gingivoperiosteoplasty, and lip adhesion (POPLA) compared with previous lip adhesion method: a preliminary study of serial dental casts. Plast Reconstr Surg. 1999 May. 103(6):1630-44. [Medline]. 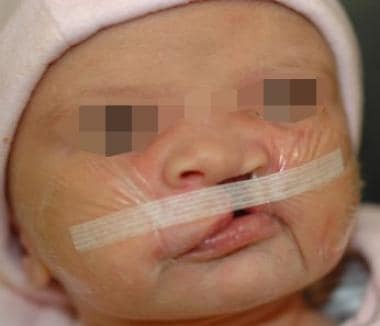 Moore CC, MacDonald I, Latham R, Brandt MG. Septopalatal protraction for correction of nasal septal deformity in cleft palate infants. Otolaryngol Head Neck Surg. 2005 Dec. 133(6):949-53. [Medline]. Grayson BH, Garfinkle JS. Nasoalveolar Molding and Columella Elongation in Preperation for the Primary Repair of Unilateral and Bilateral Cleft Lip and Palate. Losee JE, Kirschner RE. Comprehensive Cleft Care. New York: McGraw Hill; 2008. Ch. 46, pp. 701-720. Lee CT, Grayson BH, Cutting CB, Brecht LE, Lin WY. Prepubertal midface growth in unilateral cleft lip and palate following alveolar molding and gingivoperiosteoplasty. Cleft Palate Craniofac J. 2004 Jul. 41(4):375-80. [Medline]. Levitt T, Long RE Jr, Trotman CA. Maxillary growth in patients with clefts following secondary alveolar bone grafting. Cleft Palate Craniofac J. 1999 Sep. 36(5):398-406. [Medline]. Aminpour S, Tollefson TT. Recent advances in presurgical molding in cleft lip and palate. Curr Opin Otolaryngol Head Neck Surg. 2008 Aug. 16(4):339-46. [Medline]. Shetye PR. Presurgical infant orthopedics. J Craniofac Surg. 2012 Jan. 23(1):210-1. [Medline]. Rau A, Ritschl LM, Mücke T, Wolff KD, Loeffelbein DJ. Nasoalveolar molding in cleft care-experience in 40 patients from a single centre in Germany. PLoS One. 2015. 10(3):e0118103. [Medline]. [Full Text]. Mandwe RS, Puri S, Shingane S, Pawar G, Kolhe VR, Alsi A. Presurgical nasoalveolar remodeling - an experience in the journey of cleft lip and palate. Clin Cosmet Investig Dent. 2015. 7:1-7. [Medline]. [Full Text]. Rubin MS, Clouston S, Ahmed MM, M Lowe K, Shetye PR, Broder HL, et al. Assessment of presurgical clefts and predicted surgical outcome in patients treated with and without nasoalveolar molding. J Craniofac Surg. 2015 Jan. 26(1):71-5. [Medline]. [Full Text]. Rosenstein SW, Grasseschi M, Dado DV. A long-term retrospective outcome assessment of facial growth, secondary surgical need, and maxillary lateral incisor status in a surgical-orthodontic protocol for complete clefts. Plast Reconstr Surg. 2003 Jan. 111(1):1-13; discussion 14-6. [Medline]. Trotman CA, Long RE Jr, Rosenstein SW, Murphy C, Johnston LE Jr. Comparison of facial form in primary alveolar bone-grafted and nongrafted unilateral cleft lip and palate patients: intercenter retrospective study. Cleft Palate Craniofac J. 1996 Mar. 33(2):91-5. [Medline]. Power SM, Matic DB. Gingivoperiosteoplasty following alveolar molding with a Latham appliance versus secondary bone grafting: the effects on bone production and midfacial growth in patients with bilateral clefts. Plast Reconstr Surg. 2009 Aug. 124(2):573-82. [Medline]. Pfeifer TM, Grayson BH, Cutting CB. Nasoalveolar molding and gingivoperiosteoplasty versus alveolar bone graft: an outcome analysis of costs in the treatment of unilateral cleft alveolus. Cleft Palate Craniofac J. 2002 Jan. 39(1):26-9. [Medline]. Sato Y, Grayson BH, Garfinkle JS, Barillas I, Maki K, Cutting CB. Success rate of gingivoperiosteoplasty with and without secondary bone grafts compared with secondary alveolar bone grafts alone. Plast Reconstr Surg. 2008 Apr. 121(4):1356-67; discussion 1368-9. [Medline]. Masarei AG, Wade A, Mars M, Sommerlad BC, Sell D. A randomized control trial investigating the effect of presurgical orthopedics on feeding in infants with cleft lip and/or palate. Cleft Palate Craniofac J. 2007 Mar. 44(2):182-93. [Medline]. Henkel KO, Gundlach KK. Analysis of primary gingivoperiosteoplasty in alveolar cleft repair. Part I: Facial growth. J Craniomaxillofac Surg. 1997 Oct. 25(5):266-9. [Medline]. Berkowitz S, Mejia M, Bystrik A. A comparison of the effects of the Latham-Millard procedure with those of a conservative treatment approach for dental occlusion and facial aesthetics in unilateral and bilateral complete cleft lip and palate: part I. Dental occlusion. Plast Reconstr Surg. 2004 Jan. 113(1):1-18. [Medline]. Matic DB, Power SM. The effects of gingivoperiosteoplasty following alveolar molding with a pin-retained Latham appliance versus secondary bone grafting on midfacial growth in patients with unilateral clefts. Plast Reconstr Surg. 2008 Sep. 122(3):863-70; discussion 871-3. [Medline]. Matic DB, Power SM. Evaluating the success of gingivoperiosteoplasty versus secondary bone grafting in patients with unilateral clefts. Plast Reconstr Surg. 2008 Apr. 121(4):1343-53; discussion 1368-9. [Medline]. Wood RJ, Grayson BH, Cutting CB. Gingivoperiosteoplasty and midfacial growth. Cleft Palate Craniofac J. 1997 Jan. 34(1):17-20. [Medline]. Santiago PE, Grayson BH, Cutting CB, Gianoutsos MP, Brecht LE, Kwon SM. Reduced need for alveolar bone grafting by presurgical orthopedics and primary gingivoperiosteoplasty. Cleft Palate Craniofac J. 1998 Jan. 35(1):77-80. [Medline]. Shetty V, Vyas HJ, Sharma SM, Sailer HF. A comparison of results using nasoalveolar moulding in cleft infants treated within 1 month of life versus those treated after this period: development of a new protocol. Int J Oral Maxillofac Surg. 2012 Jan. 41(1):28-36. [Medline]. Massie JP, Bruckman K, Rifkin WJ, Runyan CM, Shetye PR, Grayson B, et al. The Effect of Nasoalveolar Molding on Nasal Airway Anatomy: A 9-Year Follow-up of Patients With Unilateral Cleft Lip and Palate. Cleft Palate Craniofac J. 2018 Apr. 55 (4):596-601. [Medline]. Nazarian Mobin SS, Karatsonyi A, Vidar EN, Gamer S, Groper J, Hammoudeh JA. Is presurgical nasoalveolar molding therapy more effective in unilateral or bilateral cleft lip-cleft palate patients?. Plast Reconstr Surg. 2011 Mar. 127(3):1263-9. [Medline]. Bongaarts CA, van't Hof MA, Prahl-Andersen B, Dirks IV, Kuijpers-Jagtman AM. Infant orthopedics has no effect on maxillary arch dimensions in the deciduous dentition of children with complete unilateral cleft lip and palate (Dutchcleft). Cleft Palate Craniofac J. 2006 Nov. 43(6):665-72. [Medline]. Uzel A, Alparslan N. Long-term Effects of Presurgical Infant Orthopedics in Patients with Cleft Lip and Palate: A Systematic Review. Cleft Palate Craniofac J. 2010 Sep 17. [Medline]. Choo H, Maguire M, Low DW. 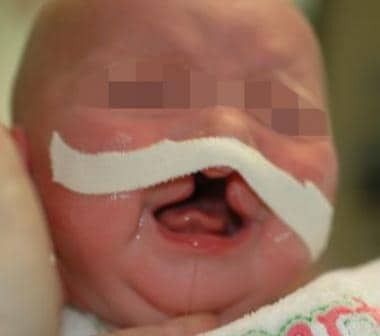 Modified technique of presurgical infant maxillary orthopedics for complete bilateral cleft lip and palate. Plast Reconstr Surg. 2012 Jan. 129(1):244-8. [Medline]. Cruz C. Presurgical Orthopedics Appliance: The Latham Technique. Oral Maxillofac Surg Clin North Am. 2016 May. 28 (2):161-8. [Medline].